Get stuffed at Ogden's Prairie Schooner. If there were a Venn diagram that included the categories "in Ogden," "craving a steak" and "possessed of a crippling need to eat inside a covered wagon," then The Prairie Schooner (445 Park Blvd., 801-392-2712) would land smack-dab in the middle of it. It's not quite worth the trip from Salt Lake to Ogden on its own, but for those who are visiting our neighbor to the north for the Ogden Twilight Summer Concert Series, the 25th Street Antique Car Show or the Eccles Dinosaur Park, it's a place that can complete your experience. Despite the fact that it's just off Washington Boulevard, The Prairie Schooner exudes a sense of seclusion from the rest of the city and an almost surreal aura of temporal displacement. Not that it feels like you've actually gone back in time to the rootin' tootin' 1800s, from which the restaurant apparently took its inspiration. It's more like you've gone back to Lagoon's Pioneer Village circa 1978. The restaurant itself looks like the exterior of a theme park ride, or as if someone excised a spaghetti Western set and transplanted it to a lot next to the Ogden River. I don't mean to cast the place in a negative light by comparing it to a theme park—it adds to the mystique when you roll up for the first time and half expect an amateur actor dressed in cowhide chaps and a fringed vest to jump out and scream "Yee-haw!" in your face. Thankfully, there was no yee-hawing, which was probably for the best. My family and I had just endured some pretty awful traffic on Interstate 15, and I'm sure my wife would have sucker-punched the first buckaroo that attempted such an interaction. Instead, we were greeted in a prompt and blessedly untheatrical fashion before we made our way to our own little covered wagon. The Prairie Schooner offers more traditional dining areas, but the draw of the place comes from being able to pretend that you're part of a wagon train that has just hitched up for the night. All seats are against the wall to replicate the effect, and each dining room is complete with a central campfire scene littered with imposing taxidermy that adds to the surreal ambiance. While the adult me was only mildly amused by the gimmicky interior, deep down I could hear 7-year-old me freaking out about getting to eat dinner at a place like this. 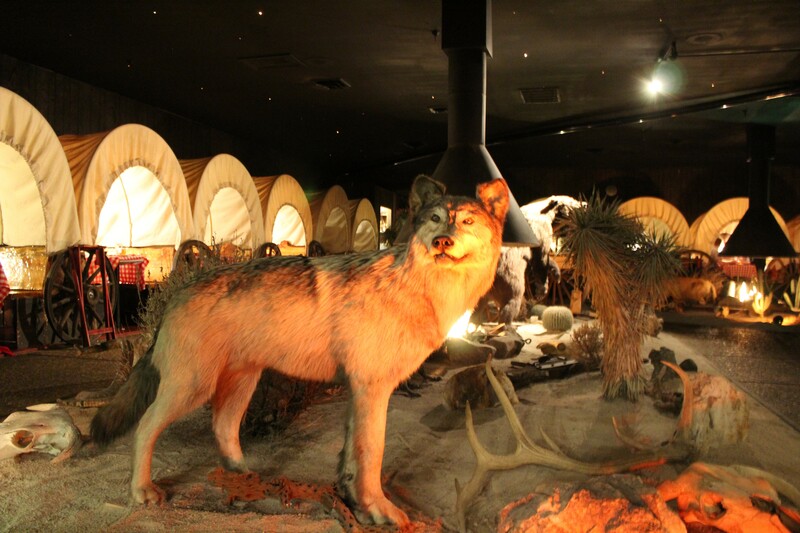 The Prairie Schooner's faux-frontier atmosphere lends itself very well to serving up a traditional steakhouse menu. You have your New York strips, your porterhouses, your prime rib and your barbecue—everything that makes us bloodthirsty carnivores drool. I've commented on this before, but if a restaurant bets big on atmosphere like this place does, it had better damned well deliver the goods when it comes to food. I spotted a promising list of steak combination plates that added seafood like lobster tails and fried shrimp to the mix, and I ended up getting the Rustler Combo ($31.99), which consists of a 10-ounce New York Strip and three big ol' fried shrimp. For $2.50 more, I added sautéed mushrooms and onions on top of that mother, and went with the au gratin potatoes. My wife got the prime rib ($21.99) with a yam covered in butter and cinnamon sugar. Service was quick, though we had a few missteps with our orders—my fried shrimp came after my steak, as did our complementary bread loaf, but no biggie overall. As steaks go, mine was decent—well-seasoned and cooked medium-rare as requested. I did run into some tough bits along the way, but I wasn't mad at this particular cut. Our server informed us the prime rib could only be cooked from medium to well, so it lacked the amount of tender-to-juicy ratio I typically favor with prime rib. And the horseradish sauce on the side was muted to the point of tasting like sour cream. I want a nasal cavity-immolating blast of horseradish with my prime rib, and this stuff wasn't quite on that level. The most surprising part of the evening was the three gigantic shrimp. Notwithstanding the vast amount of fried shrimp I have consumed in my life, it never occurred to me to batter them up before they hit the deep-fryer. Instead of the crumby, panko-adjacent fry that clings to most shrimp renderings, here you end up with fried shrimp that's more akin to a corndog. Scoff if you must, but applying this blue-collar frying philosophy to plump shrimp before squirting them with a bit o' lemon juice and dipping them in cocktail sauce is a bit of food heaven by way of the state fair. All things considered, The Prairie Schooner isn't the best steakhouse on the block, but you'd be hard-pressed to find another place where you can eat dinner inside a wagon, so it retains a peculiar level of charm. Perhaps it's this elusive quality that makes it so undeniably Ogden—a fascinating little gem in a city full of strange surprises. Friday 11 a.m.-10 p.m.; Saturday 3 p.m.-10 p.m.